Fabric Dolls--Episode Six: It's a Boy! 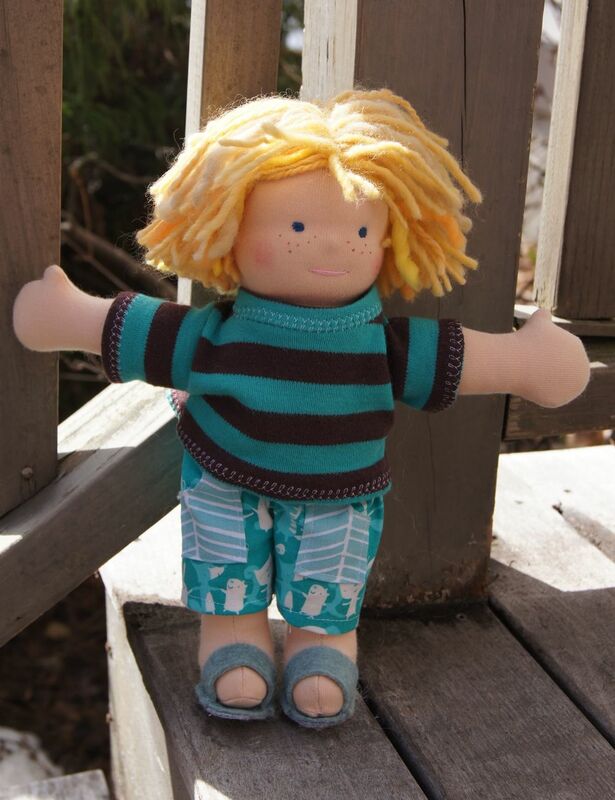 Here's my first try at making a Waldorf-type Boy Doll. This little surfer guy is 10.5" tall. It took me more time to make him than the 2 larger girls I made before him! I didn't find any clothes for boy dolls his size so I had to design everything he is wearing. I don't have any training designing patterns. It takes me a while to fuddle through the process. His pants were initially too short in the back despite his straight trunk and his shirt was too big and needed to be taken in. Once I do figure out what seems to work, I go back and re-draw my patterns so it will be easier next time I have to make clothes for a doll this size. His sandals were the easiest part of his outfit! The cutest? His sun-bleached thatch of hair! Or, maybe his underpants made from a white knit with a tobogganing polar bear print! Too funny since he is wearing board shorts! I've finally starting be able to get a doll's head rolled a bit tighter and I now know how to made tight ball under his head so his neck doesn't wobble. I think rolling the heads tightly enough is one of the hardest things about making these dolls. This little guy just makes me smile!